Thomas Edmund Dewey (March 24, 1902 – March 16, 1971) was the Republican governor of New York from 1943 to 1955. He was also the Republican presidential nominee on two occasions, losing to the incumbents, Franklin D Roosevelt in 1944 and Harry S Truman in 1948. In the latter election, he was seen by many as the front-runner. So much so, in fact, that The Chicago Daily Tribune mistakingly ran several hundred copies of their post-election edition with the headline, "Dewey Defeats Truman." A famous photograph at the time shows a smiling Truman holding up the false headline. Dewey lost because he ran a typically RINO campaign, expecting the public to automatically want to vote for him without reaching out and persuading voters. 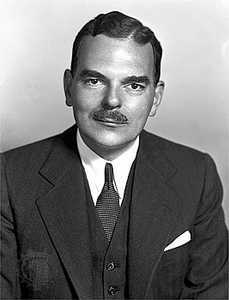 Thomas Dewey was born in Owosso, Michigan. He never missed a day of school except for an afternoon to attend a grandfather's funeral. After completing his education at the University of Michigan at Ann Arbor, he moved to New York City to complete his LLB at Columbia University in 1925. After graduation, he toured England and France, before returning to New York to join the state bar. In 1928, he married Frances E. Hutt, a native of Tulsa, Oklahoma; they had two children. In 1933, Dewey was appointed as the attorney of the southern district of New York. From 1931 to 1933, he was his predecessor's chief assistant in 1931. At the time, he was the youngest U.S. attorney ever, thirty-one years of age. However, President Roosevelt appointed a Democrat to fill the position just five weeks after Dewey took office. Dewey hence returned to his private law practice. In 1935, he was appointed special prosecutor for the Investigation of Organized Crime in New York and his campaign against narcotics and vice racketeers resulted in seventy-two convictions and only one acquittal. As a result of Dewey's successes, notorious gangster Dutch Schultz planned to have him assassinated. However, rival gangsters, fearful of the potential backlash Dewey's murder would invoke had Schultz killed instead. In office he earned a reputation for efficiency and honesty and was regarded as a "Moderate Republican". In 1937, he was elected district attorney for New York County and was elected governor 1942, a post he filled for three terms. In 1944, Dewey won the Republican presidential nomination to run against the incumbent President Roosevelt. The election took place during the World War II, and Dewey had an impossible task against combination of a popular wartime leader and Dewey's own lack of experience in international affairs. He lost, 25,602,505 to 12,006,278 votes. His running-mate was another governor, John W. Bricker, who helped the ticket to win Bricker's native Ohio. He was the Republican's nomination once again in 1948, this time running against Roosevelt's successor, President Truman. Although - or possibly because - he was the acknowledged front-runner, Dewey waged a non-committal campaign designed to avoid offending any segment of the electorate. He made only a few speeches, avoided controversial issues, and scarcely recognized the opposition. His running mate for the second race was another governor, Earl Warren, later the liberal Chief Justice of the United States. The ticket won Dewey's New York but lost Warren's California. Dewey and Warren lost to Truman and the Democratic vice-presidential choice, Alben Barkley, by the relatively narrow margin of 24,105,812 to 21,970,065, primarily because Truman retained the support of farmers, southerners, and organized labor. But in the electoral vote, Truman had a clear majority. In 1950, Dewey was elected to his third successive term as New York's governor. He did not stand in the 1952 election, and instead assisted Dwight Eisenhower to win first the Republican Party nomination and then the presidential election. In 1955, at the end of his third term as governor of New York, Dewey retired from politics and he reentered private practice with the New York firm of Dewey, Ballantine, Bushby, Palmer, and Wood. By 1957, Dewey had been awarded sixteen honorary degrees and had written several books, including The Case against the New Deal (1940); Journey to the Far Pacific (1952), based on his travels to seventeen Pacific countries, a trip suggested by State Department adviser John Foster Dulles; and Thomas E. Dewey on the Two Party System (1966). He died eight days before his 69th birthday at Bal Harbour, Florida. "Ours is an abiding faith in the cause of human freedom. We know it is God's cause." Beyer, Barry K., Thomas E. Dewey, 1937-1947: a study in political leadership, New York: Garland Pub., 1979. Pietrusza, David 1948: Harry Truman's Improbable Victory and the Year that Changed America, New York: Union Square Press, 2011. Smith, Richard Norton, Thomas E. Dewey and His Times, New York: Simon and Schuster, 1982. ↑ "Dewey, Thomas Edmund." The Columbia Electronic Encyclopedia, Sixth Edition. Columbia University Press., 2003. ↑ "Dewey, Thomas Edmund." West's Encyclopedia of American Law. The Gale Group, Inc, 1998. ↑ "Dewey, Thomas Edmund." Britannica Concise Encyclopedia. Encyclopædia Britannica, Inc., 2006. ↑ "Dewey, Thomas Edmund." Quotations. Quotations Book, 2008. This page was last modified on 1 December 2018, at 10:46.